My Silverado is the 5.3 newer body style how do I remove the heater core? Step by step with photos if available Our truck is a C1500 Silverado 4 x 4 with the 5.3L engine. The 8th diget of the vin is a "T" as in Tom. It has 131,000 miles on it and I don't know if it is original but assumed it is. The reasons I believe it needs changed is. I have no heat so I checked the following. I have inspected the modulator motor and shaft that controls the baffle for movement and the do move. I turn full hot and it moves, fully cold and it moves and medium heat and it moves half way back. I have also checked the temp guage of the truck while running and it runs in the area of 200+ deg-F. And stays there. I checked the heater hoses to the heater core and one side is hot and the other hose is not. It is just a bit above room temperature. I plan to get some hoses and try to back flush it to see if I can get anything out of it and if that helps but, I plan to keep this truck for a long time and do not want to be in a situation where I need heat and it goes out again. So I plan to replace the core and would like to know the proper sequance with any pics or diagrams that may help me. You will need to discharge and recharge the air conditioner first here is a guide to help you do that. Here is a guide to give you an idea of what you are in for when doing the job. Drain the engine coolant. Refer to Draining and Filling Cooling System in Engine Cooling. Disconnect the temperature control cable from the heater/ventilation module. Disconnect the mode control cable from the heater/ventilation module. Remove the instrument panel (IP) carrier (2). Disconnect the electrical harnesses and the ground connections as necessary. Remove the heater/ventilation module mounting nuts and the screws. Remove the heater/ventilation module assembly. 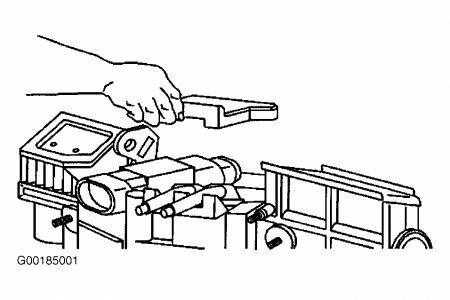 Set the module assembly on a bench. Install the heater core cover. NOTE: Refer to Fastener Notice in Service Precautions. Install heater core cover screws. Tighten Tighten the screws to 1.6 N.m (14 lb in) . Install the heater/ventilation module assembly to the vehicle. Tighten the screws to 4 N.m (35 lb in) . Tighten the nuts to 9 N.m (80 lb in) . Connect the electrical harnesses and the ground connections as necessary. Install the instrument panel carrier (2). Connect the mode control cable to the heater/ventilation module. Connect the temperature control cable to the heater/ventilation module. Refill the engine coolant. Refer to Draining and Filling Cooling System in Engine Cooling. My fluid is the orange type. Once done I will let you know the results. I do have a couple of additional questions on the data you sent me. 1) Is there more information as to what the numbers mean on the schematic? I see the drawing is showing these but nothing to reference them to. 2) If I am understanding this correctly it appears that I need to take the entire heater/A/C module out. If so, this information is very vauge and if possible is there a manual I can get that gives much more details? Is there a manual with pictures of the objects being removed? If so where may I purchase it at? I guess I am looking for a specific book on my truck and not a range of years that show general information. If not detailed enough what you may be wanting is the actual service manual I have a 1995 Impala SS and purchased the entire service manuals for this price.but I have detail. Drain the engine coolant. Refer to Draining and Filling Cooling System in Cooling System. Remove the mounting nuts and the screws from the HVAC module. Remove the HVAC module assembly from the vehicle. If you are replacing the HVAC module, transfer the components from the old HVAC module as necessary. Install the HVAC module assembly to the vehicle. NOTE: Refer to Fastener Notice in Service Precautions. Install the mounting nuts and the screws to the HVAC module. Tighten the mounting screws to 4 N.m (35 lb in) . Connect the electrical harnesses and the ground connections. Install the HVAC module drain hose. Fill the cooling system. Refer to Draining and Filling Cooling System. Here are some pictures of the core. 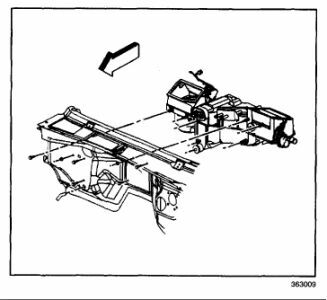 The instrument cluster must be removed to gain acess to the case assembly. It pays 6.5 hours in the book plus evac and charge the ac. 1. Drain the engine coolant. Refer to Cooling System Draining and Filling in Engine Cooling. 2. Recover the refrigerant. Refer to Refrigerant Recovery and Recharging. 3. Remove the heater/vent module. Refer to Heater/Vent Module Replacement. 4. Remove the heater core cover screws. 5. Remove the heater core cover. 6. Remove the heater core. 1. Install the heater core. 2. Install the heater core cover. 3. 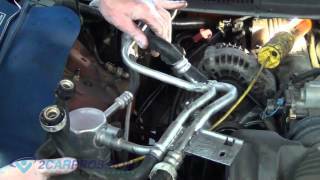 Install heater core cover screws. Tighten the screws to 1.6?N m (14?Lb?In). 4. Install the heater/vent module. Refer to Heater/Vent Module Replacement. 5. Recharge the A/C system. Refer to Refrigerant Recovery and Recharging. 6. Refill the engine coolant. Refer to Cooling System Draining and Filling in Engine Cooling. 2. If equipped remove the auxiliary battery. Refer to Battery Replacement in Engine Electrical. 3. Disconnect the heater hoses. Refer to Heater Hoses Replacement. 4. Remove the accumulator. Refer to Air Conditioning Accumulator Replacement. 5. Remove the instrument panel carrier. 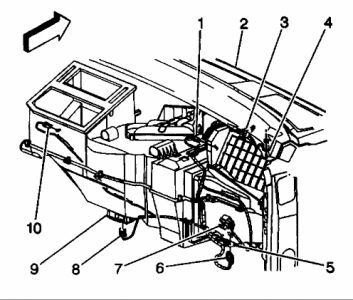 Refer to Instrument Panel Carrier Replacement in Instrument Panel, Gauges and Console. 6. Remove the HVAC module drain hose. 7. Disconnect the electrical harnesses and the ground connections as needed. 8. Remove the mounting nuts and the screws from the HVAC module. 9. Remove the HVAC module assembly from the vehicle. 1. If you are replacing the HVAC module, transfer the components from the old HVAC module as necessary. 2. Install the HVAC module assembly to the vehicle. 3. Install the mounting nuts and the screws to the HVAC module. Tighten the mounting screws to 4?N m (35?Lb?In). Tighten the mounting nuts to 9?N m (80?Lb?In). 4. Connect the electrical harnesses and the ground connections. 5. Install the HVAC module drain hose. 6. Install the instrument panel carrier. 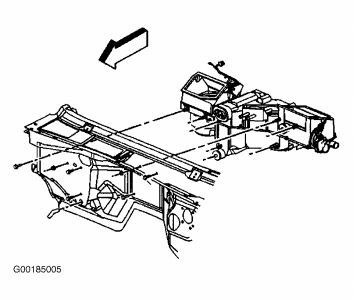 Refer to Instrument Panel Carrier Replacement in Instrument Panel, Gauges and Console. 7. Install the accumulator. Refer to Air Conditioning Accumulator Replacement. 8. Connect the heater hoses. Refer to Heater Hoses Replacement. 9. Install the auxiliary battery. Refer to Battery Replacement in Engine Electrical. 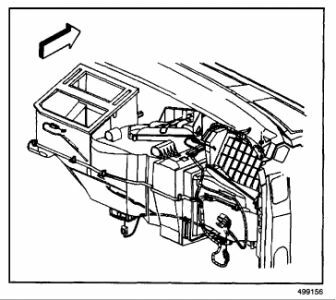 DO I NEED TO COMPLETELY REMOVE THE DASH TO REPLACE THE HEATER CORE IN A 2000 SILVERADO PU V6 4.3 NO AC. We charge labor from flat rate manual. How ever hours it say's the job is. Then we add parts and sales tax. 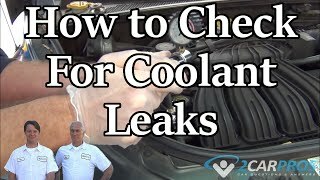 I have a 2000 chevy silverado 2500hd series Does the whole dash need to come out and the refrigerant need to be drained from the a/c to remove and replace the heater core. I know all other coolants need to be drained, just never seen one where the a/c condensor had to be removed. Also if you have any pictures or diagrams on this I would really appreciate you sending them along with your answer. 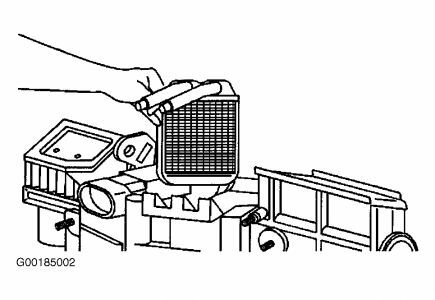 1st step in directions on how to remove and replace heater core is (Recover the refrigerant (on A/C equipped vehicles only)). Trying To Take Out Heater Core On 1987 Chevy Truck. What All Need To Be Taken Out?